You only need to know the basic functions of SketchUp and you will be able to handle any of our “3skeng tools” in a heartbeat. Focus your energy on your projects with an engineering software solution that is easy and intuitive to handle. Single Monitor Arrangement – Click picture to enlarge. Multi Monitor Arrangement – Click picture to enlarge. 3skeng List was designed to support professionals in their everyday work. It is packed with features that help to keep the model clean or find and solve errors. You can find duplicate entities, convert multiple groups to components or replace multiple components with another component of the selection. Round coordinates to the precision you prefer. Having a clean model is the foundation for high quality results. Of course, all spreadsheet views can be exported nicely formatted to Excel (.xlsx file format), or copied as plain text directly to the clipboard. You can use the definition, instance, layer and material names to add custom data columns to your components (by using the character “^” as separator in the names). Save your filter and column settings in customized list views to reuse them for repeating work. Tip: Referencing exported Excel spreadsheets in prepared Excel templates or in Trimble Layout gives you a fluent workflow for fast and reliable report generation! 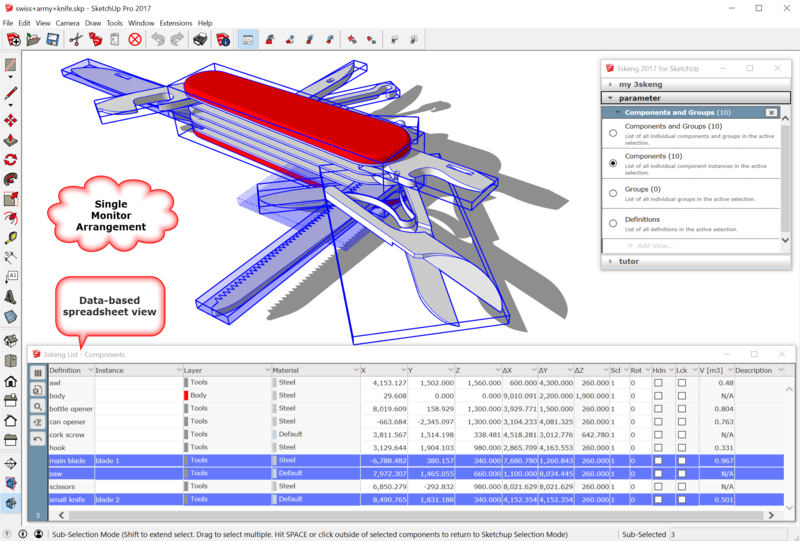 The combination of powerful selection means, almost limitless sort and edit possibilities and sophisticated reporting options make “3skeng List” an invaluable tool for everyone who wants to outperform with their SketchUp models! 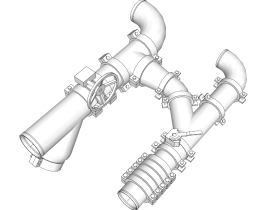 We put the “Pipe Tool” to many “real life” tests, constantly work to improve it and enable it to handle our biggest and most complex pipeline and round ductwork designs. All you need to model conceptual pipelines is integrated in this tool. 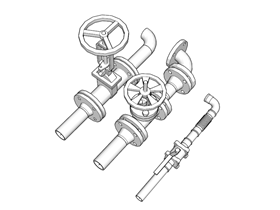 Pipes, T-pieces, Y-pieces, reducers as well as elbows are generated and connected together in a smooth workflow with only few mouse-clicks. 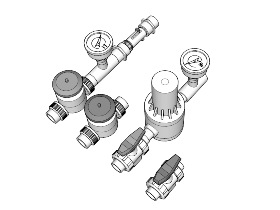 You have access to the most common standards (ANSI, ASME, ISO EN and JIS) and determine the dimensions of fittings with only a few clicks. Magnetic points and a memory function are powerful parts of the tool and assist you in the process. The detail mode brings 3D piping design to a whole new level. The access to detail mode (switchable in the 3skeng client) allows you to use libraries with dimensions that are available on the market. 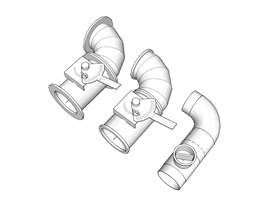 Detailed pipe libraries are available on the library page. The embedded auto-pipe function helps you to connect 3skeng components and allows you to select one of the possible configurations. 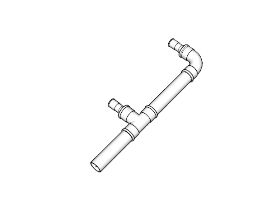 Auto-Pipe is available for both conceptual and detail mode. When you feel the need to leave the conceptual stage, the “3skeng Pipe” detail mode takes your 3D Piping Engineering to a whole new level. PP, CPVC, PVC-C, PVC-U, PVDF & PVDF-HP, PE, PE-HD and Fiberglass based on ANSI, EN and DIN standards. Imperial libraries based on AWWA standards with flanged, grooved and mechanical joint connections. Imperial library for Quick Connect, Clampring and VCR connections. Imperial and metric Galvanized Steel and Stainless Steel libraries. Metric libraries for ISO-KF, ISO-K, ISO-F and CF/UHV connection. The “Mount Tool” works with libraries that include real life channel profiles, proper fittings, supports and more. The “Mount tool” enables you to design secondary/support steelwork the same easy and intuitive way you are used to from 3skeng tools. The “Mount Tool” recognizes “3skeng Pipe” elements and assists by a) proper pre-selection from the available variety of pipe and duct clips and b) auto-alignment of rotation, position and elevation simply by double-click. 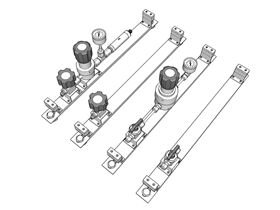 The “Mount Tool” also recognizes “3skeng Steelwork” elements to correctly attach supports to the top of steel beam flanges and beam clamps to the side of steel beam flanges. The “Mount Tool” and its libraries give you access to roller bearings, pipe-clips, -clamps, -straps and -shoes is therefore a powerful companion for both the “Pipe Tool” and “Steelwork Tool”. Being able to consider pipe and duct supports closes a major design gap and finally allows your designs to actually become reality. 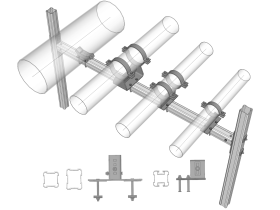 All you need to draw secondary/support steelwork models with channel profiles, proper fittings, supports and more. A memory function assists you in the process. 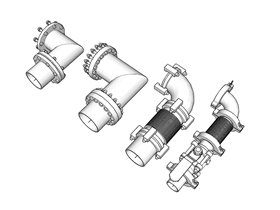 C-channels, fittings, supports and system-specific pipe supports. 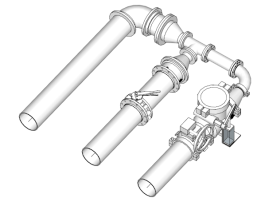 Heavy Duty O-channels, fittings, supports and system-specific pipe supports. We put the “Steelwork Tool” to many “real life” tests, constantly work to improve it and enable it to handle our biggest and most complex steelwork designs. All you need to draw Steelwork models with straight and chamfered segments. An extensive built-in library allows you to choose from many different standards from all over the world. We put the “Channel Tool” to many “real life” tests, constantly work to improve it and enable it to handle our biggest and most complex rectangular ductwork designs. All you need to draw Channel models is integrated in only one tool. 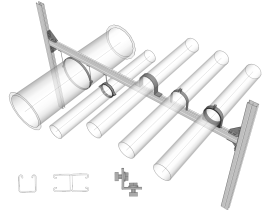 Straight channels, t-pieces, reducers (also changeover to round for pipe tool) and elbows (round and square) are generated and connected together in a smooth workflow with only few mouse-clicks. You determine channel dimensions and lengths with only a few clicks. Magnetic points and a memory function are powerful parts of the tool and assist you in the process. This control interface is the hub that gives you access to tools, libraries, standards, settings and a comprehensive context sensitive tutor. In parallel with the workflow the client supports you by giving options to choose from and detailed information – whenever needed and necessary. Add tools and libraries, select standards, adjust settings or watch the tutorials without ever having to interrupt your workflow. This tool helps you to modify the model in all feasible degrees of freedom. The speed of the tool allows you show changes and suggestions live in meetings – without anyone losing interest! The tool is intuitive in a way that nearly follows your ideas by itself. 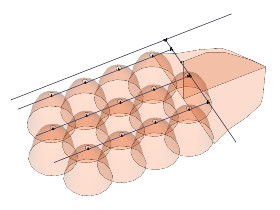 Use magnetic points for reference or the input of numeric values in the familiar SketchUp way. Works with 3skeng Pipe, Mount, Steelwork and Channel. With this tool you can rearrange or copy already generated Pipeline elements. Magnetic points will help you to connect the elements exactly aligned to the pipe center and direction. “Multicopy”: All selected elements stay glued to the mouse until you press “Escape”. Works with 3skeng Pipe, Mount and Channel. This tool enables you to add text labels to groups and components. Various adjustable parameters allow individual adaptations to the particular label task at hand. During the automated alignment you determine the position and distance of the labels. Future changes can be made in no time at all. Works with all 3skeng elements. The List Tool received a major redevelopment and ended up being a powerful stand-alone tool that bridges the gap between the two worlds of SketchUp and Excel and brings them together as one. Pipe, Mount, Steelwork and Channel come with the List features for their (tool-specific) elements. Download Starting Guide to learn how to use 3skeng. Date and time can be rescheduled based on NTC availability and will be discussed later. Electronics by email. No media kit. Please give us older serial number in “order note” when checkout. Without it your order will be canceled.